Randall Johns had always been able to see both sides of an argument, and therefore found it difficult if not impossible to choose one over the other. It was not because he was timid or indecisive, lacking in moral fiber, or a cultural relativist; but because immediate temporal concerns always faded, became indistinct, and disappeared over time. What was considered right, true, and noble five-hundred years ago is thought quaint, troubling, or ignorant today. Whether economic theory, religious practice, social organization, political movements, or cultural expression, nothing is of absolute value, all is reconsidered and rethought, and different paradigms of purposeful behavior are elaborated. This is not to say that Randall was either amoral or immoral. He abided by the codes of ethics and morality that prevailed, insisted that his children follow them and deviate as little as possible from them, and tried to act honorably and honestly. When it came to any more than these well-defined, limited moral precepts – that is any attempt to give them a higher, more universal, or more generalized authenticity – he demurred. Creating movements out of personal rectitude always lead to division, dissension, and disharmony. 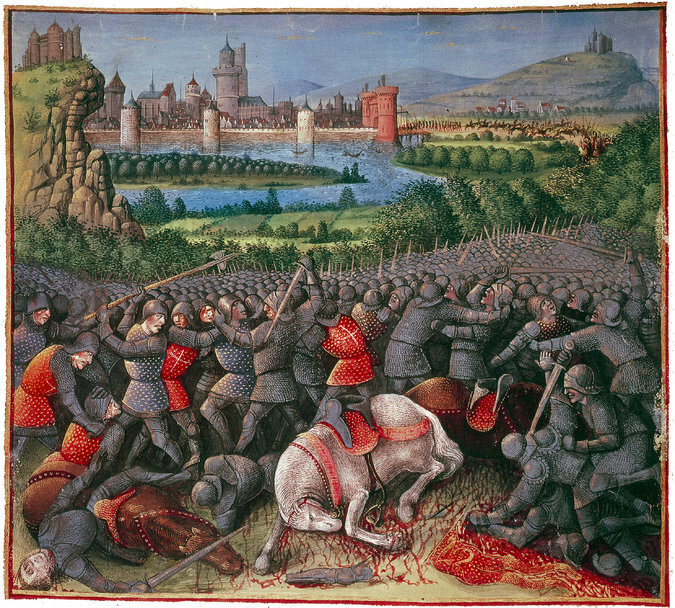 The Crusades transformed simple religious belief into Holy War. Mohammed’s Islamic crusade was based on an even simpler and more austere belief, but there was nothing simple about Muslim expansionism and conquest. The Crusades did indeed expand or at least consolidate Christianity – a good thing in the mind of Christians who devoutly believed in the divinity of Jesus Christ, his redemption, and salvation. The Crusades were also examples of militant political expansionism – ridding Jerusalem and the Holy Land of the infidel was as much driven by imperialism as it was by faith. The French, Russian, and American Revolutions put elitist aristocracies on notice. The world would no longer tolerate authoritarianism and political power would always remain in the hands of the people. Of course the Jacobins gave the Revolution a very bad name, as did Lenin, Trotsky, and Stalin. Power may shift centers, but some form of central authority will always remain or resurge. Religious tolerance was a feature of the American Revolution, but militant Islam wants no part of it. How, they say, can secular law possibly supersede God’s law? The entire concept of the secular, democratic nation-state is being challenged from Asia to Europe and the Americas. While these historical events are neither not new nor surprising, they are raised here only to illustrate Randall Johns’ increasing lack of enthusiasm for causes, movements, and reform. Not only do political ideas and convictions come and go, but because they are by and large secular and temporal, there can be no point in investing any energy in them. Leading a moral, ethical life in accordance with the standards of the times is enough. Given the perennially changing nature of principle, there would be no point in taking sides or investing valuable personal energy. Therefore when asked about abortion, gender transformation, income inequality, climate change, or socio-cultural diversity, Randall demurred. There were legitimate moral arguments against abortion, and valid positions concerning individual and civil rights. The reconfiguration of the gender binomial into a spectrum of possibilities seems to some a deformation of essential Biblical teaching; but to others it is no more than a physical expression of cultural dynamism. Moreover in the post-human generation virtuality will replace reality, and genetic recombination will completely transform what we think of as human nature. Binomial sexuality will be a thing of the past. If global warming is an irreversible phenomenon, then the human organism can be as easily modified to adapt to new conditions as GMO seeds. The nature of morality within a virtual world is completely unknown, and the need for it may disappear entirely. A man like Randall Johns, keeping his own counsel, never exercised about venality, ignorance, greed, adventurism, and arrogance because they are part and parcel of the human experience, unchangeable since homo sapiens and probably long before that, is in progressives’ crosshairs. How, in the face of such corrosive, selfish, and theatrical politics, could he possibly sit on the sidelines? With the climate heating rapidly, the polar ice caps melting, and corn crops moving steadily northward, how could he demur? Where were his principles? Typically, Randall never rose to the bait. Whether put on earth by design or accident, he was created with intelligence, wit, insight and creativity; and since there were no absolutes – no irreducible causes or principles – there was no point in directing these attributes to anything other than personal satisfaction and even enlightenment. Figuring out what’s what before the end of his life may have nothing to do with either life, death, or what comes after; but it certainly had more reasonable salience than anything else. Randall never expected the virulence of the attacks against him. Somehow diffidence, regardless of how intellectually well-grounded it might be, was far more threatening than a simple difference of opinion. Few people were able to take “I don’t care” as an answer. Randall was by no means ignorant of the various political issues dividing the country. In fact, because he saw both sides, and was willing to consider both, he could argue strongly and intelligently. This was not to say that he argued both sides. On the contrary, he was very decisive about his economic, social, and cultural conclusions. He saw no contradiction in having to stake in the arguments and arguing well. Even if it did not matter to him whether or not the conservative measures he favored in education, social welfare, justice, and economics became law, defending his positions using his fluency, focus, historical perspective, and quick uptake was satisfying if not fun. His close friends understood him well – diffidence had nothing to do with lack of interest, appreciation of nuance, or even relative rightness of opinion. It was simply that Randall did not care about outcomes. Process was distinct from product. You could indeed have one without the other. Those who knew him less well became defensively argumentative when the discussion turned to politics. They, arguing from personally validating positions, insisted that they meet him on equal grounds; and when he demurred, or withdrew from an argument before it had concluded, they were nonplussed. More than that Randall was threatening to those who had built their self-image and public persona on the basis of political philosophy. Anyone who was indifferent to such philosophical belief and who had no interest in using it to create, burnish, or expand personal influence was dangerous. It was one thing to fight to the end over a point of deeply-held political principle; another thing altogether to lay down the white King and ask for a rematch. Despite the overwhelming evidence that history repeats itself, that cultural and social mores come and go; that economic systems rise and fall, and that empires emerge and disappear, there are those who believe that this time it will be different. If only we acted together with passion, commitment, and energy, we can make a difference. We can make the world a better place. The likes of Randall Johns are nettling. They disturb idealistic perfection without saying a word. Their mere silence is a rebuke, an unanswerable criticism. There is no way to respond to anyone with long historical vision and an intelligent future one. Randall Johns went about is business. He was never arrogantly indifferent or dismissive of others’ concerns. He was patient, eager to engage, and conversant with most issues. He, and only he, could walk away from an argument calm and collected. He had invested nothing other than debating skills. His challengers, however, went back to lick wounds that were far deeper.